Step2 All Around Wagon #Giveaway CLOSED! Spring is just around the corner and like many others out there we have been enjoying these warmer days outdoors with our kids. With the warmer weather rolling in it means that it is time to go out and get the new toys for the kids to play with outside. One of my favorite companies to purchase kids outdoor products from is Step2. I love the variety of products they have, from the play houses, play kitchens, art desks to the wagons that you can choose from. We have had a Step2 wagon for several years, since my daughter was a toddler, and it is a product that has held up through both my daughters use and my sons use over the years. After staying outside for several years, the sun has taken a tole on only the color of our wagon so this year one item that I was wanting to get my kids was a new Step2 wagon that will last another 7 years! Recently I was given the chance to choose a product from the new line of Step2 products. When I was told about the new wagon, I knew that I had to go with the Step2 All Around Wagon to review. It is amazing on how many updates can be made to something as simple as a wagon to make it even more enticing to have for the kids. I mean, when I see the new products that come out I think, why didnt they have that when I was a kid. We had those plane old wagons that did not have seats nor any holders for our juice or snacks, and the wagon we had growing up was rough, lol. Wagons have literally come a long way since then, they are almost like a vehicle device that your kids can travel around in very comfortably. The new Step2 All Around Wagon has seats that fold into a flatbed, two seats, or one seat and a table. It has 6 cup or snack holders as well as a large storage capacity, which is perfect for those cookie and candy fundraiser sales!! There is even a small trunk to store extra toys, snacks or juices in. This amazing wagon has a door that opens and closes easily for entry and exit, to top it off, there are even seat belts included to keep those little ones secured safely. I had said that the wagon I had when I was little was rough, well this one is a luxury version compared to the once ruff and rugged wagons I remember. 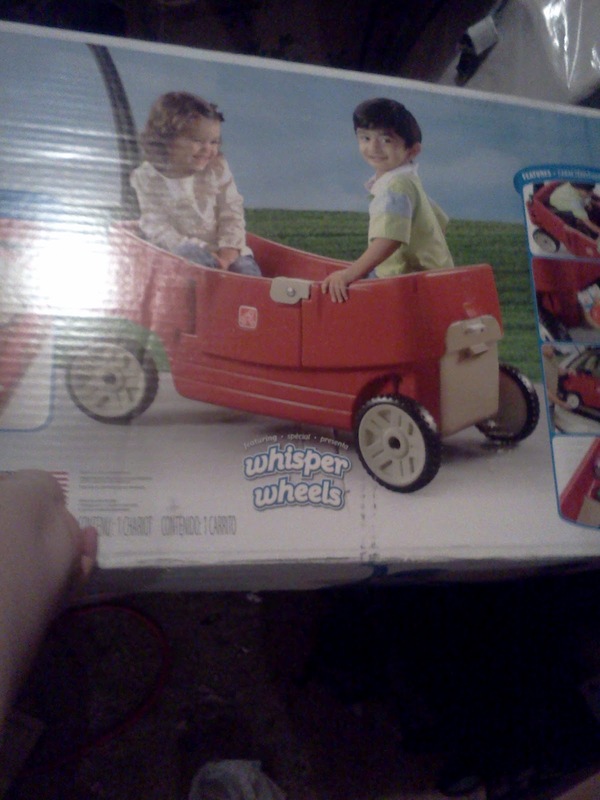 The wheels are “Whisper Wheels”, which give this wagon a smooth and quiet ride! I find the Step2 All Around Wagon to be a must have when you are stocking up on those outdoor Spring items for your kids!!!! To help prepare my readers for Spring, the wonderful people from Step2 are giving one of my amazing readers their own Step2 All Around Wagon!!!! Head on over to the Step2 site and tell me another product you would like to get!! Please leave me your email with this entry!!!!! This giveaway is open to US residents. This giveaway will end at 11:59 pm on April 16,2012. Winner will be chosen at random.org and will be given 48 hours before another winner will be chosen. All products for reviews and giveaways are given as a sample from the companies. All opinions in reviews I conduct are my own. I was not paid to say anything or review any products. Next Post Hammock Bliss: Gearing Up For Outdoor Family Adventures! entered the Little Mommy Baby So New Doll 4/15 giveaway. entered the $75 Zutano Gift Card 4/13 giveaway. entered the VeggieTales: Robin Good and His Not So Merry Men 3/24 giveaway. entered the The Lorax and Seventh Generation Diapers 3/29 giveaway. I would love to have the Clubhouse Climber! Thanks for the great giveaway! I like Step2 on Facebook. I like Mommy Katie on Facebook. I truly love their outdoor storage bench. This would be great to have out by our pool. commented on OC Daisy Easter Special 50% Off!! I'd like the Extreme Coaster. forgot to give myself 2 entries for this so here is the #2 entry commented on OC Daisy Easter Special 50% Off!! I liked Step2 on facebook.